HOST PLANTS: Ash flower gall mite affects ONLY male flowers. The mite feeds on the unfolding tissues, causing them to form irregular gall clusters of 12 mm in diameter. Galls start out green, then turn brown to black and persist over the winter. 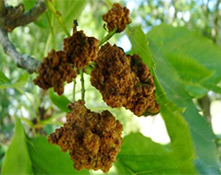 Although the galls are unsightly, they are not harmful to the tree since they only affect the flowers. This cigar-shaped mite is one of a group of eriophyid mites that cause galls to form on plants. This mite becomes active as male ash flower buds break in the spring. The size of the mite is less than 0.0 mm. 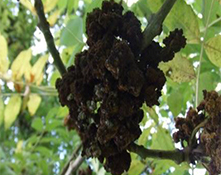 It causes a proliferation of flower buds to form, which results in unattractive galls. 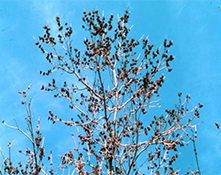 No treatments are necessary, but galls may be pruned off to improve the tree’s appearance. If treatments are deemed necessary, use horticulture oil as a dormant treatment. Mites become active as flower buds break in the spring. Use a contact insecticide when first blossoms begin to emerge. Landscape oil can be used when the plant is dormant or in the summer when leaves are fully expanded and hardened off. Reference: A Pocket IPM Scouting Guide for Woody Landscape Plants Diane Brown-Rytlewski and Nursery and Landscape Plant Production 383.